I’m old enough to remember the Falkland’s War but young enough to have given little thought to the Argentinian perspective at the time. If there was a legacy for the UK it was in the enhanced reputation and popularity of Margaret Thatcher; but clearly defeat would also have its consequences. This is the topic Carlos Gamerro tackles The Islands, published originally ten years after the war, and translated into English by Ian Barnett a further decade later in 2012. It’s a lengthy volume of over 500 pages, though apparently 100 pages shorter than the Spanish original, and might be described as baroque thriller. The central character, Felipe Felix, is a computer hacker and Falkland’s War veteran, is hired by the inordinately wealthy Fausto Tamerlan to obtain the names of thirteen witnesses to a murder committed by his son. (The name seems significant: Faust suggesting the pact with devil which Felix will make; Tamburlaine the violence and death that Tamerlan leaves in his wake). It will not surprise you to learn that unearthing the witnesses’ identities will reveal a wider plot which links back to Felix’s Falkland’s experience. It’s at this point you realise two things: firstly, whether the novel is for you or not, and secondly, that Gamerro is a writer who will not be holding back. Tamerlan is such an over-whelming character that I found the novel was most gripping in the scenes in which he featured (just like a villain in a Bond film). The novel works well as a thriller: we have the luckless hero, who, once he becomes caught up in events finds he cannot simply walk away; a love interest who is soon in mortal danger; a secret document; and layers of different motivation for both the crime and the cover-up. Running parallel to this is a critique of Argentina’s invasion of the Falkland Islands. Most of the characters are veterans and the plot itself takes us back to events on the islands. At one point Felix creates a computer game that allows the player to win the war for Argentina. All this culminates in a lengthy flashback to the invasion as Felix recalls what happened with a familiar sensation of being let down by those who led. This sits a little uneasily with the thriller plotline as Gamerro provides more detail than necessary, yet is an excellent piece of writing in its own right. 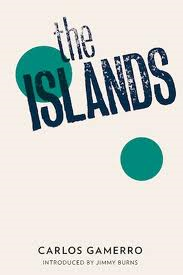 On the strength of The Islands Gamerro seems to be a writer worth watching (one other novel, An Open Secret, has been translated into English, with a third due next year). While a little rough around the edges it is alive with energy and imagination, with some scenes that won’t leave my memory easily! It wouldn’t be Spanish Lit Month without at least one Roberto Bolano, and luckily, despite his death in 2003, English translations are still appearing faster than I can read them. I always feel a little intimidated discussing Bolano as there is a sense that the sum of his works is greater than its parts. By that I mean, that even with a partial knowledge of his writing, it is clear that certain ideas, themes and characters reoccur as if they were part of some larger plan. For that reason I thought it would be best to read a volume of his short stories, The Return, translated, as always, by Chris Andrews. Confusingly this volume contains stories from both a 1997 and a 2001 collection – the same collections that were plundered for Last Evenings on Earth (presumably these are the ‘leftover’ stories). Despite this precaution, there are still stories which clearly form part of the ‘bigger picture.’ ‘Photos’, for example, features Bolano’s fictional alter-ego Arturo Belano and (of course) an anthology of poetry. The more accomplished ‘Detectives’, written entirely in dialogue, relates the tale of Arturo’s time in prison from the point of view of two of his guards, former classmates. Death is commonplace in many of the stories. In ‘Prefiguration of Lalo Cura’ the narrator begins, “I’ve had people killed.” ‘Murdering Whores’ is, as its title suggests, about a female killer. In ‘William Burns’ a man kills someone he believes to be a threat on what seem in retrospect unconvincing reasons. Bolano’s world is one of unglamorous criminals, unexceptional non-comformists, the weary and the stateless. Here he effortlessly inhabits their attitudes and voices, neither sympathetic nor uncaring. He also shows a technical variety that suggests someone as comfortable with short story as with the novel. It seems there is not escape from the feeling that Bolano is a writer where you must read everything – because everything is worth reading. Adolfo Bioy Casares is probably best known for his friendship and collaboration with Jorge Luis Borges. They wrote a number of books together, adopting the pen-name of Bustos Domecq, and co-edited the anthology The Book of Fantasy. Casares was an author in his own right, however, most famously of the novel The Invention of Morel. Now, thanks to Melville House and translators Suzanne Jill Levine and Jessica Ernst Powell, we have another of his collaborations, Where There’s Love, There’s Hate, which he wrote with his wife Silvina Ocampo. Where There’s Love, There’s Hate is not an unjustly neglected classic, but it is an absolute delight, the fun the couple clearly had concocting their tale communicating itself charmingly to the reader. Above all, his investigation, based largely on his knowledge of detective fiction, is frequently well off the mark. Meanwhile the real investigation (of which he thinks he is an integral part) goes on around him. When he finds Manning and Atuel making notes on detective novels which Mary has translated he refers to this as “childish activities” little knowing that they are closer to discovering the truth than he is. What is impressive about Where There’s Love, There’s Hate is that it works successfully as a whodunit while at the same time satirising the genre. Casares and Ocampo also create an insufferable narrator with whom the reader happily spends time. Any lover of detective fiction looking for something a little different should get hold of this book. When Andres Neuman’s fourth novel, The Traveller of the Century was translated into English in 2012, it was clear that a writer of some significance had been made available to those of us who do not speak Spanish. It made the shortlists of both the IMPAC award and the Independent Foreign Fiction Prize, and was widely praised. Now those same translators, Nick Caistor and Lorenza Garcia, have given us Talking to Ourselves, Neuman’s own follow up to Traveller, originally published in 2012. (Perhaps in time his earlier novels will be translated – a collection of short stories, Things We Don’t Do, will appear next in English). Talking to Ourselves is quite unlike Traveller – where Traveller is an baroque, historical epic, Talking to Ourselves is a much quieter, more intimate, contemporary novel. No doubt some readers may find this disappointing, but I found it both exciting and refreshing, a confirmation that Neuman was a talented writer intent on exploring his craft. Neuman conveys the intensity of the sadomasochistic relationship that develops convincingly, creating an unusual counterpoint to the road-trip. Interestingly, at no point did I find Elena an unsympathetic character, her obsessive lust seeming an understandable response to death. Overall I found the novel to be a moving exploration of loss – not just the loss that occurs with death, but the loss related to the knowledge of approaching death. 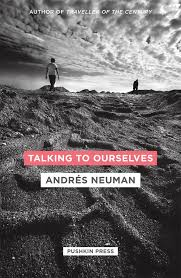 Talking to Ourselves might not have the scope or ambition of The Traveller of the Century, but it does convey the ambition of Neuman as a writer. 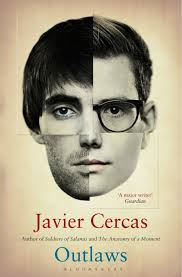 Javier Cercas’ novels exist on the border between fiction and non-fiction. His last work, The Anatomy of a Moment, was an examination of an attempted Francoist coup in 1981. His latest, Outlaws, is also concerned with the aftermath of Franco’s death, beginning, as it does, in 1970s Spain. It tells the story of teenage criminal, gang leader and self-styled rebel Zarco, largely through the eyes of his friend and accomplice Canas. Canas makes an unlikely bank robber coming, as he does, from a stable, middle class family; he is regarded by all as a quiet, studious boy until he meets Zarco. Canas’ culpability in all that follows is just one of the questions that the novel forces us to consider. While Zarco is undoubtedly an influence on Canas, it is Tere, whom he assumes is Zarco’s girlfriend, who attracts him to the gang (“if it hadn’t been for Tere, I most likely wouldn’t have done it”). The gang begin by stealing handbags and cars and robbing what we would call (but not the translator Anne McLean) petrol stations. After some of the members are killed and injured in a police chase, Zarco decides to use the stolen goods to purchase guns and begin robbing banks. Zarco is clearly a charismatic figure and Canas’ attitude towards him, even moderated by the fact he is telling the story many years later, is intended to represent the way he later comes to be seen by the public in general. A British equivalent might be the Great Train Robbers, who also seemed to have gained an anti-establishment tag, though I suspect that that fact that the gang are Catalans plays an important role. (As with the Great Train Robbery, there is a film version of Zarco’s life which is frequently mentioned in the text). The novel is presented entirely as a series of questions and answers. The questioner is a writer researching a book on Zarco; Canas is the main interviewee. Other contributors are the police inspector who arrests Zarco, and the prison governor who becomes responsible for him. This style contributes considerably to the verisimilitude of the novel while at the same time creating the impression of an ongoing investigation, as if the reader were approaching some kind of truth. Cercas cleverly avoids interviews with the other two main protagonists, Zarco and Tere, leaving us to view them only through the eyes of others. This makes their characters harder to define as even Canas’ perception of them both changes over time, but that is one of the ways the novel leaves the reader uncertain in their reaction to the novel’s protagonists. Canas becomes Zarco’s lawyer and begins a publicity campaign designed to free him from prison. Zarco appears self-obsessed and manipulative, but it could also be argued that Canas is using his notoriety to further his own career. Simultaneously, Canas begins a relationship with Tere. Is he only helping Zarco to be with her? Is she only sleeping with him as long as he aids Zarco? Such questions are never given simple answers, with even the protagonists themselves apparently unsure of their motivations. (One of the novel’s great strengths is the way it relentlessly questions why we do things). Cercas also links changing attitudes to Zarco to Spain’s move towards democracy. His youthful rebellion coincides with throwing off the repressive regime of Franco, but twenty years later his actions appear selfish and immature; he has become the perpetual victim (but, then, he is a victim, having never been given the chance that Canas got). Once again Cercas seems determined to take a scalpel to Spain’s history, in a novel that has elements of both thriller and courtroom drama, but is ultimately a character study of three characters who cannot untangle themselves. One advantage of Fraile’s non-appearance in English before now is that it allows translator Margaret Jull Costa to choose a selection of stories from his first volume (1954) to his last (2010), and even include one unpublished story. Fraile’s stories are miniatures, rarely reaching ten pages. They tend to focus on ordinary, often undramatic events. Some, like the title story, are set over a few hours: in it a sign painter descends to a new Metro station to paint the platform signs. The story tells of his relationship with an ill-tempered foreman and culminates in his decision on discovering he made a mistake on the sign when he returns to the surface. The title is a gentle play on words referring both to his emergence into the sunlight and his attitude to his job after his encounter with the ferocious overseer. While clearly identifying the physical necessity of the light, Frail also insists on its poetic necessity. In an unusually surreal turn, when the sisters die their bodies give of a faint glow. 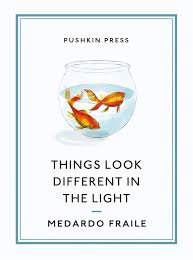 Luckily, thanks to Pushkin Press, Fraile’s own words have not been similarly obliterated. July is Spanish Lit month thanks to Stu at winstonsdad and Richard at Caravana de recuerdos so it seemed appropriate to begin with one of my favourite Spanish writers. (You can see Stu’s the first entry here). Eduardo Mendoza’s most recent novel to appear in English was An Englishman in Madrid (not a literal translation of its Spanish title); his first novel, The Truth About the Savolta Case, might well have been called A Frenchman in Barcelona. (It did, in fact, have an alternative title, Soldiers of Catalonia, but this proved too politically sensitive when it was first published in 1975). Though largely narrated by Javier Miranda (more on that later), its events revolve around the charismatic French businessman, Lepprince who, shortly after his arrival in Barcelona, becomes indispensable to the Savolta company. It is Lepprince who takes the reins after Savolta is gunned down, supposedly by anarchists, after a bitter industrial dispute. This is only one of a number of deaths in the novel as Mendoza uses the crime genre to explore Catalonia’s turbulent history between 1917 and 1919 – its political chaos possibly a surreptitious way of reflecting anxiety about Spain’s future without Franco. The novel’s narrative, perhaps appropriately for a mystery, is presented to us as a jigsaw. While Miranda is the central first person narrator, there are many other voices, including a transcript of Miranda’s deposition before a judge in America in 1927, a sworn statement by Inspector Vasquez, who plays the detective role in the story, and articles written by the radical journalist Parjito de Soto (another murder victim) as well as third person sections focussing on other characters. These are not always presented in chronological order, adding to the reader’s sense that they are solving the riddle, but it would be wrong to think of the novel as a post-modern playground where the word ‘Truth’ is ironic: by the novel’s conclusion it is quite clear who has done what and why. If anything, Mendoza’s novel might be described as Dickensian. Not only does it comfortably range across the classes from Nemesio the mad beggar to the King, who graces one of Lepprince’s parties, but is clear about the economic motives of its characters. The central scam of the Savolta case involves selling illegal arms to Germany. Lepprince’s ruthless takeover of the company only mirrors the way Savolta and others came into their shareholding having duped the original Dutch owner and his heirs. Even Parjito is corrupted by Lepprine’s offer of money to conduct an ‘investigation’ into working conditions. Other Dickensian tropes are in evidence: a letter that Parjito posts before his death incriminating Lepprince which no-one seems to have; Nemesio who claims to know the truth but who no-one will listen to; and Miranda, implausibly innocent as so many of Dickens’ heroes are. Miranda is redeemed by his love for the singer Maria Coral, but is so blind that, when Lepprince arranges for them to marry, he doesn’t realise that Lepprince’s main motive is to have Maria available as a lover. It could be argued, however, that Miranda’s love for Maria eventually saves her (literally when he finds her ill, but also metaphorically from herself). His loyalty to Lepprince is also admirable, if equally naïve. Again, Lepprince’s final act, through Miranda, suggests that, even there, he has had a positive influence. Like Dickens, and like most detective fiction, most characters get what they deserve. The Truth About the Savolta Case is currently out of print, but well worth seeking out if you are interested in Spanish fiction. Despite the fractured narrative, the novel is very readable (and many of the different narrative forms disappear in the novel’s second half) and Mendoza recreates the period with panache but without ever losing sight of his characters. My only disappointment in finishing this was that I have now read all of his novels available in English. You are currently browsing the 1streading's Blog blog archives for July, 2014.